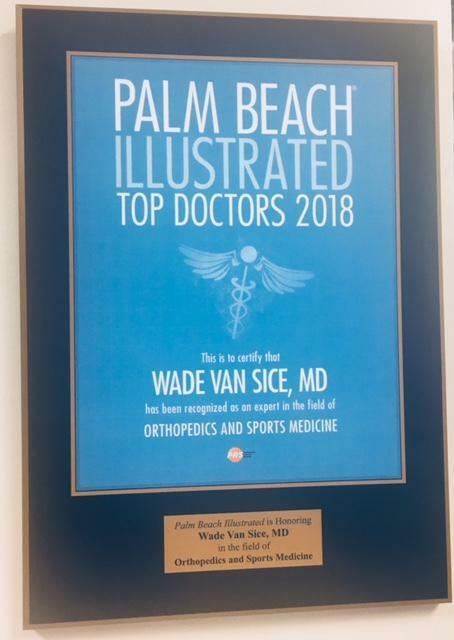 Dr. Wade Van Sice is a fellowship trained sports medicine specialist, practicing at Jupiter Orthopedics and Sports Medicine, in Jupiter, Florida. He focuses on minimally invasive, arthroscopic surgery of the knee, shoulder, and elbow. Dr. Van Sice has extensive training in complex reconstruction of the knee including multi-ligamentous reconstruction (ACL, PCL, MCL, LCL, and posterolateral corner) and shoulder including rotator cuff, labrum, sub-acromial impingement, suprascapular nerve entrapment, instability, adhesive capsulitis, and injuries specific to the throwing shoulder. Dr. Van Sice attended Clemson University where he obtained a Bachelor’s of Science in Biological Sciences. He continued his studies at Tulane University School of Medicine graduating with a Medical Degree and a Master’s of Public Health in 2006. Dr. Van Sice completed his orthopedic residency at Tulane University then went on to complete a Sports Medicine Fellowship at Kerlan and Jobe Orthopedic Clinic in Los Angeles. During his residency and fellowship, he trained under the guidance of the country’s leading sports medicine surgeons. While in Los Angeles, his team coverage experience included the Los Angeles Lakers (NBA), Los Angeles Dodgers (MLB), Los Angeles Kings (NHL), and the University of Southern California. 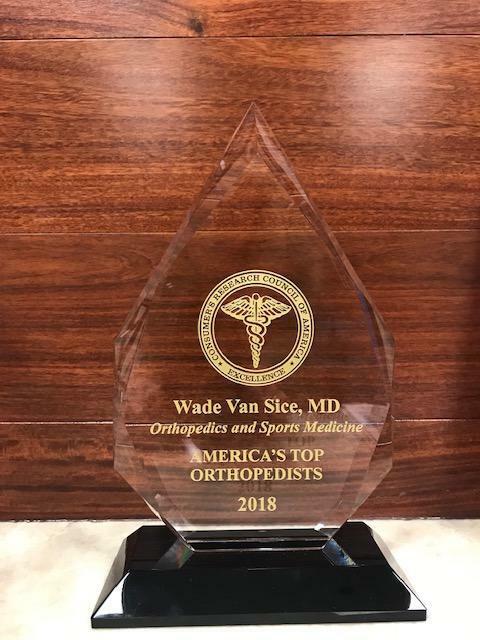 Dr. Van Sice is a member of the American Orthopaedic Society for Sports Medicine and the American Academy of Orthopaedic Surgeons. Like his predecessor, Frank Cook said, “If you listen to the patient they will tell you what is wrong.” Dr. Van Sice believes patients should be confident in their care, and that is what he strives to provide. He is very fortunate to receive the recommendation and excited to be in Jupiter. He is very active in sports competing in the decathlon in college, and now enjoys sand volleyball, cycling, and group fitness. Dr. Van Sice focuses on keeping active people active. New patients are welcome, and most major forms of insurance are accepted. "The drive from Boca was totally worth it. Helpful and courteous every step of the way." "Dr. Van Sice and his staff were all amazing! I'm so thankful I went there!" " I would highly recommend his office to anyone." "I truly recommend Dr van sice to you dear atlete...you are in exceptional hands!" "So lucky to have you here in Jupiter!! A gentleman and an outstanding doctor!!" "Excellent experience, fast and knowledgeable." "Very impressed with Doctor Sice and his staff. Had a minimal wait"
"Doctor Wade and his staff were super friendly, but very professional." "Excellent care and service!! I highly recommend Jupiter Orthopedics." "Great group and very professional staff. Wait time was low and staff was accommodating." 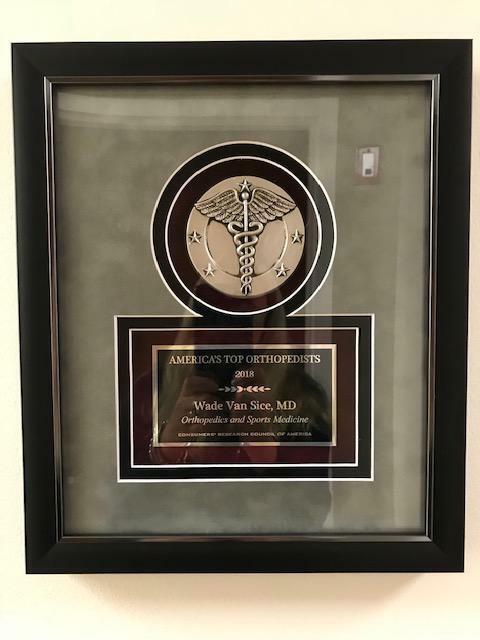 Dr. Van Sice was recently awarded the distinguished honor for Top Doctor 2018! during football season for high school athletes that are injured. We specialize in Football, Baseball, Rugby, Golf, Tennis, Biking, and Running related injuries. Out of Network Insurance Policy - We will work with your insurance carrier if your plan permits us to see you outside of your insurance network. "He is very professional,knowledgeable and caring. I am very thankful for his expertise and attention." "A gentleman and an outstanding doctor!! Thanks for all your care." "I am extremely pleased with the surgery, the process went very smooth and Dr. Van Sice and his staff have provided me with top notch care." "Dr. Van Sice's staff is responsive and compassionate." "It's not easy to find a smart, grounded and humble orthopedist who you can trust...I was very impressed that he put my best interests ahead of just doing a surgery"
"Dr. Van Sice was highly recommended to me by a friend. He is a great doctor and his staff is excellent too!" "Dr. Van Sice is a top notch doctor supported by outstanding staff both in his office as well as in the surgery center." "We were always treated as his top priority and we received first-rate care. Our family is very happy with Dr. Van Sice and his team, and we recommend the practice"
"Dr. Van Sice and his staff were all amazing! I'm so thankful I went there, great experience all around and my arm is feeling so much better"
:Dr. Van Sice is a very smart and talented professional. He is always a pleasure to see and takes his time to understand the issue and explain my options"
I may not be a professional athlete nor am I a celebrity, but the care and compassion of Dr. VanSice and his team surely has made me feel like I am from my first call! "I appreciate the enthusiasm and energy the doctor had. They accomplish a lot on the initial visit...i.e..Xrays, Ultra sound...and I left knowing the issue."